Today is a MIXED BAG of fine fishy goodies, and we’ve doubled up from last week’s missed day of fishing. We will have tips on freezing fish at the pick up, so you can enjoy these great species in future weeks. You will likely see a lot of the same species as many of the prior weeks, but I can’t quite tell you what they are because they haven’t been landed yet–it’s that fresh folks! Looking forward to seeing you at the Chatham Farmers Market today. And don’t forget to pick up other fun meats, produce, bread, herbs, and desserts in support of the area’s local farmers and bakers! As this is the last week of the our Spring 2012 Weir Harvest CSF share, we would all like to say THANK YOU for your support. It’s been a good season for us fishing, and we’re happy to share it with you all! To be responsible consumers and true connoisseurs, we must choose short distribution chains, able to guarantee the origin and freshness of seafood, whenever possible. ….who can do it better? ours comes straight out of the weirs and onto your plate. 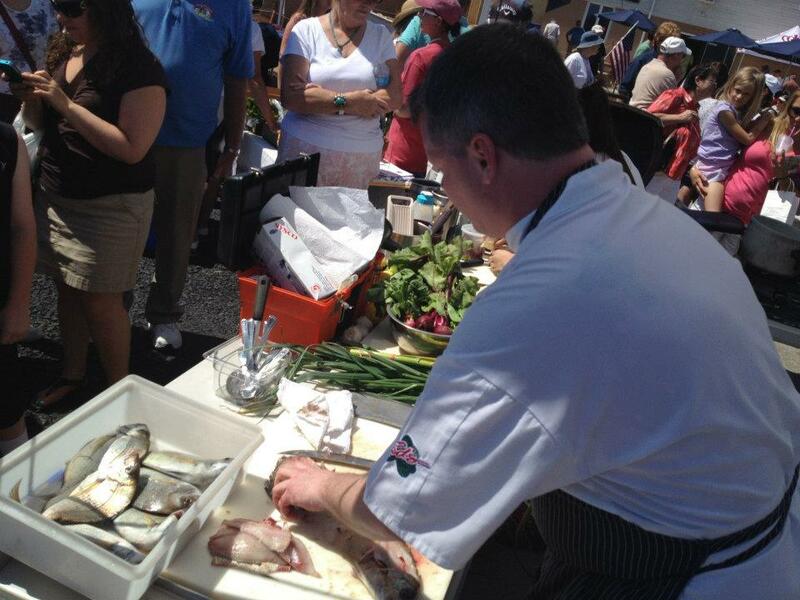 Weir produced scup made an appearance at the Cape Cod Seafood Throwdown on Sunday. Chefs Daniel Kenney and Ben Porter each had a limited amount of time, a couple of grills, a hot plate and 25 bucks to prepare a wonderful dish from the fish and locally grown produce. 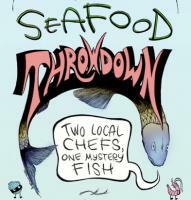 Many thanks to those who participated,Chefs Porter and Kenney and to Dan McKiernan of MA Division of Fisheries, and Gwen Friss of Cape Cod Times. Capt. Eldredge also presided as third judge. Awards wen to Ben Porter of the Belfry Inn. Shannon Eldredge, captain’s daughter, was also on hand to narrate a talk on the weirs using her beautiful model. Many thanks go to her for organizing this event along with our good buds, the Northwest Atlantic Marine Alliance. and this is what I did – I rewrote thoughts from last week’s summit; there were hundreds of great ideas to report, new collaborations, ongoing projects etc. But my take away is for those of us living close to home – my primary reason for supporting a csf is learning to love and nurture the resource. Transnational Summits and Local Throwdowns! This week’s updates include a rundown on the trip Morgan and I made to the National Summit on Community Supported Fisheries held in Portsmouth last week in Trap Talk….along with a few new pages in regular feature sections. Updates on regular features ~ We have some new links in Your Fish spotlighting two blogs under the Butterfish page – the Dented Bucket, a link to JP Lee’s great story, “the fish that built a port” Also, an interesting link on a collective in RI called “Eating the Ecosystem.” There’s an interesting piece on understanding the connections between the ecosystems and how we eat specific to place – Georges Bank, Southern NE and the Gulf of Maine…. all waters our fishermen fish. In Food – please check out Safe Handling of your Fish – including some tips on safe transport, as well as freezing and thawing should you choose not to cook right away. For those still struggling with filleting a fish – I posted a video from our friends up at Port Clyde with a demonstration. This Week’s Fish ~ Captain’s Catch, a mixture of blues, scup and fluke! Each week new updates will be included on the catch – species sheets with recipes and seasonality, sustainability information will be under the About tab. 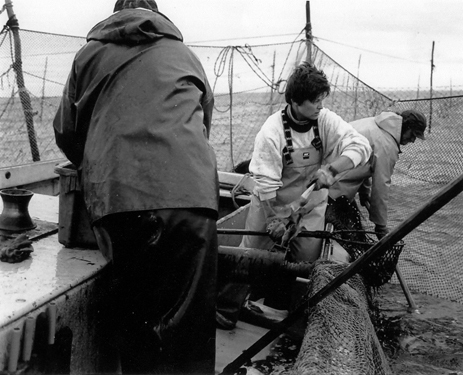 Talks from the Traps is a new section of the blog, pretty much focusing weekly on things coastal – whether it be people, fish, science or whether, the weather. Trap talk is about anything related to how we live in a town by the sea…. first talk is with Shareen Davis, the new outreach coordinator for the Massachusetts Fishermen’s Partnership and visionary of the new Trap space at her family’s commercial fishing dock on Stage Harbor. Lucky you who got their black sea bass last week enjoyed it because as of 24 May, the black sea bass fishery is now closed. Fortunately for you and the fish – those fish still swimming in the weirs were released after Ernie’s quota was taken. Black sea bass are in and offshore at different times, and what happens inshore is often based on what happens further out. However, inshore is state, and offshore – federal….and how the fish are counted, or caught happens in both. Have a quick look at the complexity of regulations….